Increasing Spa Retail Performance-NuFACE microcurrent for home use! - Spa Advisors, Inc.
Increasing Spa Retail Performance-NuFACE microcurrent for home use! Why does Spa Advisors, Inc. like the NuFACE microcurrent devices? By now, most of you looking to develop spa programs, or those looking to increase their retail service sales have heard of microcurrent. Professional devices can be found in medical spas and days spas across the United States. The services are usually add-ons and although highly effective, can be expensive. Many between the ages of thirty and fifty are looking for ways to avoid needles and scalpels. This is an amazing tool in the arsenal for those guests. Why not allow your guests the ability to buy one for home use? You will not lose them as an aesthetics client! You will simply be allowing them the ability to perform this at home, as they have time. Frankly, this is no different then allowing them the ability to purchase the highly effective skin care brands you use for facials and body treatments. What selling techniques work best for these items? You must use these during the facial and, you must let the guest know what you are doing. Let the guest know they can prolong their results by performing this service at home daily or a few times per week. Let them know the investment pays off in only a few months as microcurrent services are often add-ons to facials. Make sure you have ample information in your retail area and a strong statement. It is great to feature this device on your in-house marketing video loop. Talk about the device on your web page. Demo the device in your retail area. Often there is a fear of pain or discomfort. This allows the guest to feel how easy and effective this device can be. Yes, many guests look for cheaper prices online. Check out your online competitors before you run an event and decide whether you want to meet or beat competitor pricing. Not everyone prices compares online; however, many do! Give incentive to your employees. Work with your rep to come up with a great event coupled with staff incentives to focus them on this amazing device. Include this device in your yearly marketing calendar. Focus on it at least once every six weeks. 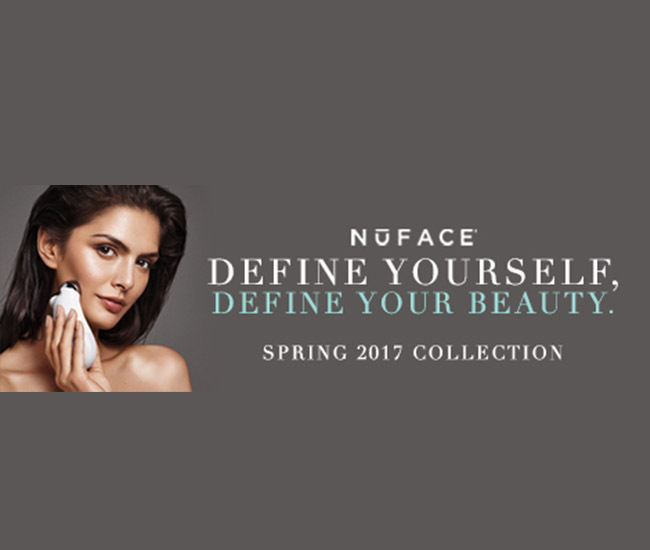 NuFACE is the leading innovator of clinically proven multi-solution at-home devices used by every woman to look and feel more beautiful. NuFACE products are sold worldwide in spas, retailers and on QVC as well as on our website. Founded by women, for women, NuFACE is focused on transforming the way clients approach skin care by delivering clinically proven, non-invasive devices for ideal skin health. Made in the USA, FDA-cleared and professionally recommended, NuFACE delivers innovative multi-solution products to consumers worldwide. At NuFACE, we understand that beauty is no longer simply about wanting to look younger. It’s about wanting to look like your best self. Our spring #Beautytome campaign is focused on inspiring women to define what beauty means to them and share their unique beauty with the world. Our microcurrent devices help clients achieve a beautiful, radiant look by enhancing their natural contour and skin tone. Carol Cole, the creator of NuFACE, began her career more than 30 years ago as an aesthetician at the famed Golden Door Spa in Southern California, where she specialized in microcurrent facials. Understanding her clients’ desires for a non-invasive, at-home, easy-to-use, anti-aging solution, Carol sought to develop a handheld device that would use microcurrent technology for women who wanted to take anti-aging into their own hands. With the help of her daughters, Tera and Kimberly, Carol launched the first NuFACE device in 2005 with overwhelming success. The NuFACE business and product line has grown exponentially over the last 12 years and continues to be a leader in skin care innovation. Our best-selling product, the NuFACE Trinity®, is the first and only FDA-cleared, handheld multi-solution device. Known as the “5-Minute Facial-lift®,” the NuFACE Trinity includes the Facial Trainer attachment that has been clinically proven for improved facial contour, skin tone and wrinkle reduction in as little as 5-minutes a day. This award-winning device, designed with interchangeable treatment attachments, including the NuFACE Trinity Wrinkle Reducer and NuFACE Trinity ELE, allows for multiple skin therapies with one device. Do you offer different brands or classifications of products? We offer at-home devices as well as a full line of skin care products including gel primers designed for use with microcurrent, infusion serums, cleansing cloths and hydrating mist. Our hero product is the NuFACE Trinity device. Additionally, the NuFACE Trinity Wrinkle Reducer and NuFACE Trinity ELE attachments are popular products as they can be used with the NuFACE Trinity device to address specific areas of concern. Our Gel Primers are necessary for use with the NuFACE microcurrent devices and our clients are big fans of our new leave-on formula 24k Gold Gel Primers which contain ingredients known to help firm and brighten the skin. Pareto’s Principal states: 20% does 80%. What are the 20% doing the predominance of your business? The NuFACE Trinity device, the NuFACE mini device, along with the NuFACE Trinity Wrinkle Reducer and NuFACE Trinity ELE attachments would be our 20%. Our devices use microcurrent therapy for facial stimulation, sending soft, gentle waves through the skin, tissues and down to the facial muscles. Microcurrent has been shown to stimulate ATP production, which drives the creation of key structural proteins such as collagen and elastin. The increase in ATP also energizes the facial muscles, the way exercise energizes the muscles of our bodies. Unlike anywhere else on the body, the facial muscles are directly connected to the skin, thus the result of energizing the muscle is often an improved, lifted appearance. We like to refer to NuFACE microcurrent therapy as Fitness For Your Face™. Exercise sculpts and tones the body, microcurrent contours and tones the face. Like exercise, benefits are visible and long-lasting. Skin Care is Your Nutrition, Microcurrent is Your Exercise. What is your smallest opening order? Accounts must purchase a minimum of six devices for their opening order. This can be either all NuFACE Trinity devices, all NuFACE mini devices or a combination of both. What types of support do you offer to your retailers? Do you offer rep support, on-line education, in-store collateral, YouTube training or other means of educating staff? We offer rep support, in-store training, annual Business Building Seminars in various locations throughout the US, quarterly webinar training, in-store and online marketing materials tied to each of our campaigns, event planning guidance, merchandising guidance, specific NuFACE protocols to incorporate products into in-spa treatments, selling sound bites for front desk staff and online how-to videos. NuFACE periodically offers contents for spa and salon staff members of NuFACE accounts. With NuFACE, product demos are the best way to drive sales. Offer all your clients a free 5-minute facial-lift™ either in the retail area of the spa or as a free add-on to their facial treatment. Most clients fall in love with NuFACE once they’ve experienced it, so make sure that everyone on your staff is trained to do a 5-minute facial-lift™ and encouraged to demo the NuFACE device when possible!